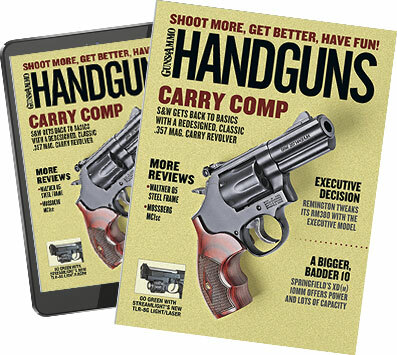 New Handguns TV co-host Brian Stas has been a law enforcement professional for more than 12 years--having served as a U.S. Navy master at arms, Connecticut State Police trooper and NYPD officer. The 37-year-old Stas, who hails from Pelham, NY, is a certified NRA instructor and an active trainer of military and law enforcement personnel. As co-host, what do you hope people get out of the TV show? For one thing, this show has provided me with the opportunity to shoot guns I didn't know existed, or did know about but had never got the chance to see or handle. Maybe people watching the show don't get that hands-on experience, but they do get to see some classic handguns and learn about the history that these guns represent. I also consider myself a student for life, and I learn a lot about myself with each round I fire. My mind's always going 100 mph, but when I'm behind the trigger and concentrating on the shot, I'm in a different place. I hope it comes across to the audience that they need to keep learning and growing as shooters as well. What's your preferred defensive handgun design? I'm a nostalgic guy, and we just did this in a segment in a recent episode where we talked about our favorite guns. My dad was NYPD and shot an S&W Model 10. A lot of people nowadays look down on revolvers, but those guns are still more than capable of making hits. But for everyday carry, I'm a big fan of Glocks and SIGs. They're very compatible, they're durable and they're very reliable. They're always going to go off, and if they don't, a quick "tap-rack" and you're back in the game. Of the guns we shot on the show, I really liked the SIG Sauer P250. It was my favorite. Right out of the box it was very accurate, and it fit me really well. Do you think the U.S. military should axe the 9mm and go with the .45? I don't think they should scrap it, no. Hey, at the end of the day it's up to the shooter to make the hits, and I think that's easier with the 9mm. It's not like the 1911 doesn't have its problems, and the debate over the knockdown power of the .45 can go on forever. But in the end you have to make the hits. And, besides, in today's military there's a little more of an open door as far as what some units can shoot, so some will go .45. But for the average troops I like the 9mm. What handgun load do you think is the most decisive fight-stopper, if there is such a thing? Again, for me it comes down to functioning, reliability and the ability to make hits, so I like the 9mm. For defense I like Speer jacketed hollowpoints and Cor-Bon's +P. People are able to shoot the 9mm well and make hits. Ammo for the 9mm is a lot easier to find, too. For a guy like me who's carrying for defensive purposes, I may have to go find some at a moment's notice, and I think the 9 is more available at more places--and it's not as expensive. You've trained a lot of shooters--military, law enforcement and civilian. What's the No. 1 piece of training advice you'd give to people who want to be better shooters but don't have a lot of time to practice. The biggest thing is always fundamentals. Not stance so much but a good grip, getting on the front sight and trigger control. People should work on those at the range, but I think they can make bigger improvements faster by taking instruction. I tell people to shop for an instructor like you would a new gun. Interview them to find out if they're "in the box"--always doing the same thing the same way--or if they're more open-minded and willing to try different things. I like the latter, but you need to find what works for you and makes those hits happen.